South Korea`s top mobile carrier SK Telecom announced on Thursday it will build a 5G mobile network for Seoul’s C-ITS project, an intelligent transportation system that allows drivers to receive information through a vehicle-to-everything (V2X) system on major roads in a faster speed than through the 4G LTE network. The project, the country’s first 5G-enabled C-ITS aiming at building a safer transportation system, calls for the establishment of 5G sensors and Internet of Things architectures, bus and taxi terminals for 5G communication, 5G control centers for data collection and information sharing and a testing ground for self-driving solutions. Under the plan, SK Telecom will build a smart infrastructure equipped with roadside sensors and V2X communication facilities. It will also provide 2,000 5G terminals to buses, taxis and traffic signal controllers. 5G V2X base stations and terminals will be jointly developed with Samsung Electronics. The project will last by the end of 2020 with an initial budget of about 25.4 billion won ($22.6 million). Target roads are 121.4km long in total, which include bus rapid transit (BRT) roads and urban express ways along Gyeongbu Expressway, Gangnam-daero, Gyeongin Mapo-ro and Tongil-ro. 5G-equipped vehicles are in sync with nearby stations and traffic lights to collect data on a rolling basis. 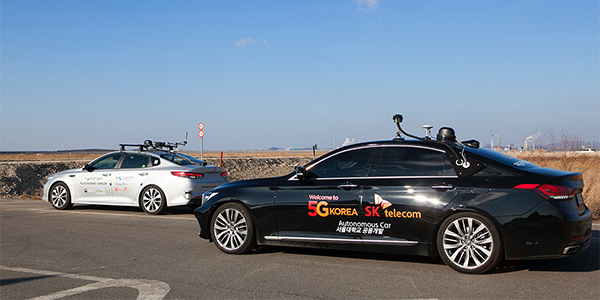 SK Telecom and the Seoul Metropolitan Government will analyze the data in real time to understand risky situations and alarm other 5G vehicles in the affected area. 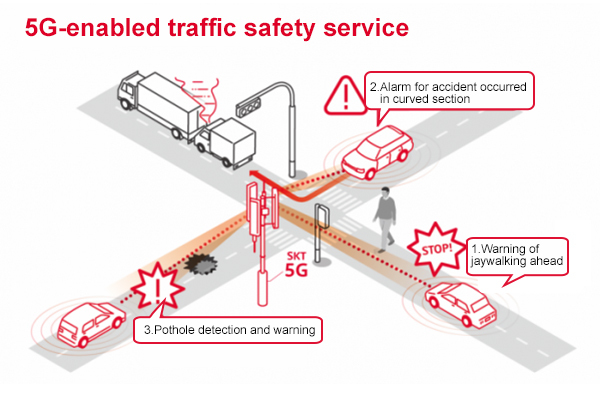 Traffic information will also be shared with non-5G vehicles through SK Telecom’s T map service to help drivers avoid possible traffic accidents. 5G’s rapid-fire response time, 10-fold faster than that of the LTE, enables data sharing to be completed within 0.01 second, allowing drivers to respond faster. This means a vehicle running at 100km/h can detect a road risk on the 5G network before moving 28cm forward. It was 2.8m on the LTE network. Meanwhile, SK Telecom and the Seoul Metropolitan City will create a 5G urban test site for autonomous driving on actual roads by June in the Digital Media City, a high-tech complex which houses offices, apartments and TV stations.